Last week I was reading the blog of the online magazine Lonny (which is awesome & I highly recommend you check it out! 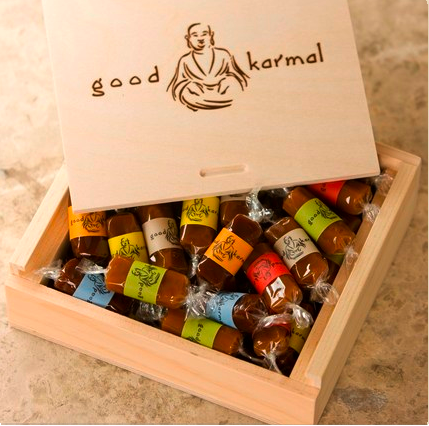 ), and they did a little feature on a company called Good Karmal, which makes a variety of delicious caramels. Their operation began in 2002 with the hope of "creating a gift that might sweeten the world" — without additives or preservatives. They also believe in doing what they can to help preserve the Earth, so a portion of their proceeds go to environmental charities, and their packaging is made from renewable resources into containers that can be recycled or reused.